Dr. John Hennig, who was appointed as records office in 1946, had left Germany because of the Nazi regime and had a remarkable grasp of foreign languages. He helped acquire the ever increasing flow of foreign peat handbooks, scientific papers and patents that became available when the war ended and indexed, translated and made them available not only to Bord na Móna staff but to Irish industry in general. Kotri Hangelaid had been general director of the Estonian State Turf Company before the war and had been responsible for the large briquetting plant at Tootsi which was built in 1937. He carried out milled peat research for us when he was appointed as a peat technician based in the Experimental Station in Newbridge. In 1951 he reported on the suitability of Oweninny, Co. Mayo for milled peat production. He also translated Russian publications. Konrad Petersen worked in the peat moss industry in Latvia before the war, after the war ended he ended up as a refugee in Sweden where he met Bord na Móna Managing Director, Todd Andrews. Andrews offered him a job which he accepted. 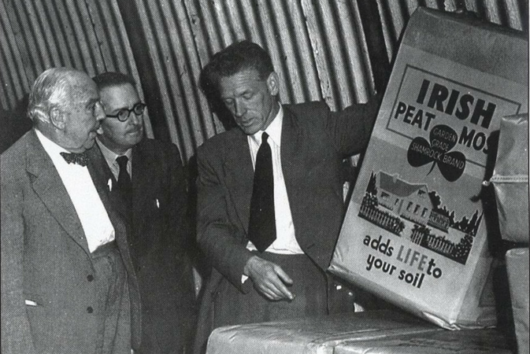 On arrival in Ireland Petersen was appointed manager of the Kilberry moss peat factory in Kildare where he spent the rest of his working life. These are just some of the foreign workers who contributed to the development of Bord na Móna.